Remembering our first president Vladimir Galitzine who has reposed in the Lord on February 22, 2018. Here is an interview with him from a few years ago. The princely line of the Galitzines is one of the most ancient aristocratic families of Russia and exists for almost 600 years. Representatives of this family have included ministers, ambassadors, governors, leaders of the nobility, scholars, musicians, writers, patrons of the arts and collectors… The October Revolution scattered them throughout many nations and continents, but wherever they may be, the Galitzines continue to serve their Homeland and Church, God and the people. 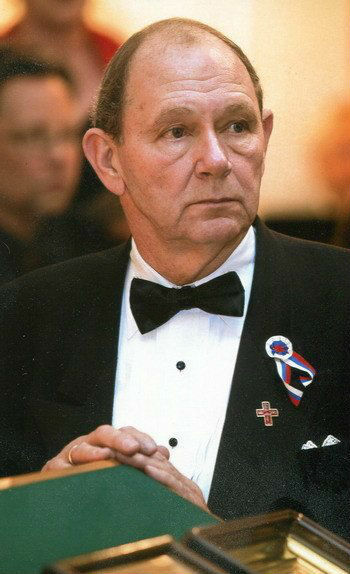 Prince Vladimir Kirillovich Galitzine has been Warden of the Cathedral of Our Lady of the Sign in New York for 38 years. This cathedral is one of two churches housed in the headquarters of the Synod of Bishops of the Russian Orthodox Church Outside of Russia on the East Side of Manhattan, on Park Avenue and East 93rd Street. The facade of the building bears a plaque inscribed “Sememenko Memorial.” For fifty years, the Synod of Bishops has been located here, and the mansion has become a New York City landmark. – Vladimir Kirillovich, you have been the Warden of the Cathedral of Our Lady of the Sign for 38 years. What in this building have you made with your own hands? , along with the First Hierarch of ROCOR, Metropolitan Anastassy (Gribanovsky). I was only 18 at the time. We made picture frames by hand, we rewired the electricity, made hangers for the episcopal vestments, and often prepared trapeza meals for Metropolitan Anastassy and his guests. The building itself also required some reconstruction: the former ball room became the Cathedral of Our Lady “of the Sign,” the main dining room was transformed into the Chapel of St Sergius of Radonezh, where daily services are held now. The living room of the former owners became the Synodal hall, where the Synod of Bishops convenes. – The Synodal building is also the residence of the Primate of the Russian Orthodox Church Outside of Russia. You knew and served under all the First Hierarchs, Vladimir Kirillovich. Tell us what you remember of each of them? – Metropolitan Anastassy was an intelligent, calm person with a variety of interests. He would ask me about the banking industry, about the computers that were being invented then. He always had a million questions! I often think of one of the most important moments of our family life. When my wife, Tatiana Vladimirovna and I were married, Vladyka Anastassy invited us to his residence and blessed us with icons, which we cherish to this day. Following the blessed repose of Metropolitan Anastassy, the bishops could not choose a head of the Church from among two candidates for a long time: Archbishop John of Shanghai, now glorified as a saint, or Archbishop Nikon (Rklitsky). And then Vladyka John proposed the youngest of the hierarchs be appointed Primate—Bishop Philaret (Voznesensky), the Vicar of the Australian Diocese. Metropolitan Philaret was a strict ascetic, but he was interested in youth ministry, worked with youth himself, he helped the school at the Synod a great deal. Vladyka Philaret loved music a great deal, and was himself a talented liturgical composer. Metropolitan Vitaly was also memorable as a strict monk, who, at the same time, loved for everything in church to be beautiful, tasteful; he did not tolerate disorder in the altar. I knew Metropolitan Laurus when he was still an archimandrite. He often visited our home: my sons Kirill and Gregory were altar boys under him, they would accompany him on trips to other parishes. Vladyka Laurus often came to stay at our home. We considered him a member of our family, we loved him a great deal, and his death was a deep personal loss for us. – Vladimir Kirillovich, how did your family end up abroad? – My ancestors left Russia through Yugoslavia in 1920. There my mother, Marina von Enden, studied in the high school, where she met my father. I was born in Belgrade in 1942, and towards the end of that year we fled as refugees to Germany. Mama finished Oxford University, and she spoke seven languages. The Germans put her to work as a court interpreter, to translate sentences to soldiers, including those who were sentenced to death. After that traumatic experience, Mama categorically refused to translate anything, though America was in need of translators, and she had every opportunity to find herself a good-paying job. During the War, we fled through Berlin to the American Zone, and reached Munich. We lived in the [displaced-persons] camps. In 1951, we came to New York and settled in Brooklyn. We lived poorly, but still, Mama was able to enroll me in a good school on a full scholarship. Every year I had to take exams to extend my scholarship. After school, two universities offered me scholarships: I was a good football player, and such players are always in demand at colleges. The problem was I didn’t even have the money to travel there. In 1960, I went to work for Bank of New York and took correspondence courses. At first I worked as an accountant, and six months later, my boss recommended me to another position. There I put together a good Russian team, one member of whom later became my wife, Tatiana Vladimirovna Kazimirova. We were married in 1963. – How did your career develop in the banking world? – I worked in the Bank of New York’s International department. At first in America I worked on financing raw materials: gold, silver, cotton; I worked with Italian, Greek and Maltese banks. In the 1990’s, I headed the Eastern European Department and actively studied our new territories: Rumania, Hungary, Bulgaria, Poland and East Germany. This was a very interesting period; I still have friends from the former Socialist countries. Soon we began to work with Russia and the former Soviet republics. We helped the bankers of Ashkhabade, Alma-Ata, Yerevan, Tbilisi and other capitals of the CIS emerge into the international market. People often couldn’t understand why I loved to travel to such remote places, where there was often no fuel for the airplanes to depart on schedule. But this was an interesting, productive time, a time of historic change. Actually, this period in my career was not only the most successful but the most fruitful, pleasant and educational. – Summing up the impressions of the trips to your historic homeland, tell us, is this the same Russia you heard about from your parents? Is it the same homeland they wished to return to? – When I first came to Russia in 1990, it was odd, and terrible, to see that most of the churches were destroyed or turned into garages and warehouses. With each new visit, I began to notice that these garages were being removed from the churches, and that monasteries were being rebuilt. During one of my trips to Moscow, I stayed at Balchug Hotel, and I saw the Cathedral of Christ the Savior going up before my eyes. People even worked at night, and in a twenty-four-hour period, the edifice rose another few meters. It is hard to express in words the impression this made upon me. Even then, there were colossal changes noticeable in church life there. We usually attended vigil and Liturgy in one of the smaller churches of Moscow. And not only were old women praying there, but young people, and a good number of men, too. – Your retirement has approximately coincided with the reestablishment of canonical unity between the Russian Orthodox Church Outside of Russia and the Church in the Fatherland. You now spend a great deal more time at the Cathedral. On February 6, with the blessing of His Holiness Patriarch Kirill, the honorable head of St John Chrysostom was brought to the Cathedral of Our Lady of the Sign, which is kept at Moscow’s Christ the Savior Cathedral. – This was a very important event, and a remarkable moment in the church life of the Russian diaspora. It became possible thanks to the fact that now we are united, we pray together, we approach the Holy Mysteries together. The visit of holy relics to the countries where Russians of all the waves of immigration live, for those who work and study abroad, is important for all of us Orthodox Christians. It is likewise important that there are now a multitude of believers who come to New York, and without fear of repercussions can venerate the holy items of our Synodal Cathedral, the holy things that appeared to have been lost for the believers of Russia. And now, many years later, they have found them again—across the ocean. The Cathedral also houses a reliquary crafted in Russia which contains the right hand of Holy Grand Duchess Elizabeth, and a portion of the relics of St Barbara. This is the main holy relic of the Russian diaspora, which in 2006, before the reunification, made a grand “pilgrimage” throughout Russia, accompanied by His Grace Bishop Michael (Donskoff) of Geneva. Archimandrite Cyprian painted icons of St Xenia the Blessed of St Petersburg in time for her glorification in 1978 (a copy of which has been distributed throughout the whole word), and of St John of Kronstadt. Next to this icon hang his own vestments. Since the very establishment of the Cathedral, before the glorification of the Royal Family, we had an honorary “royal corner” which contains the icon of St Nicholas with the depiction of other saints in a frame which contains a part of the mantle of the Royal Confessor, which he wore during his coronation. I would like to share a story about a new icon brought as a gift from a delegation from the city of Kursk. This is a depiction of the Kursk-Root Icon with scenes from its history. It seems providential that one of them, in the right corner, shows a ship sailing away from skyscrapers towards Russian cupolas, the ship itself containing the Icon with several priests. The iconographer related through paint his hope that the holy icon would return to its homeland. This icon was given to us even before reconciliation, when there could not even be a thought of bringing this holy icon back to Russia. Yet the event painted by the iconographer came to be very quickly, historically speaking. This once again proves that with God, all things are possible: last summer, the miracle-working Icon made a “pilgrimage” to Moscow and Kursk, where hundreds of thousands of believers venerated it.